São Paulo Symphony Orchestra, Marin Alsop (conductor). By now we are becoming very familiar with the fact that Marin Alsop is a superb conductor of the music of her one time mentor, Leonard Bernstein. Naxos has already done more than most to promote the music of the great American composer during this centenary year. We have enjoyed the 8 CD (&1 DVD) set Bernstein: Marin Alsop Complete Naxos Recordings released in February this year that contains each of the pieces on the current release but for those who, for whatever reason, don’t wish to buy that box this is a most welcome release. 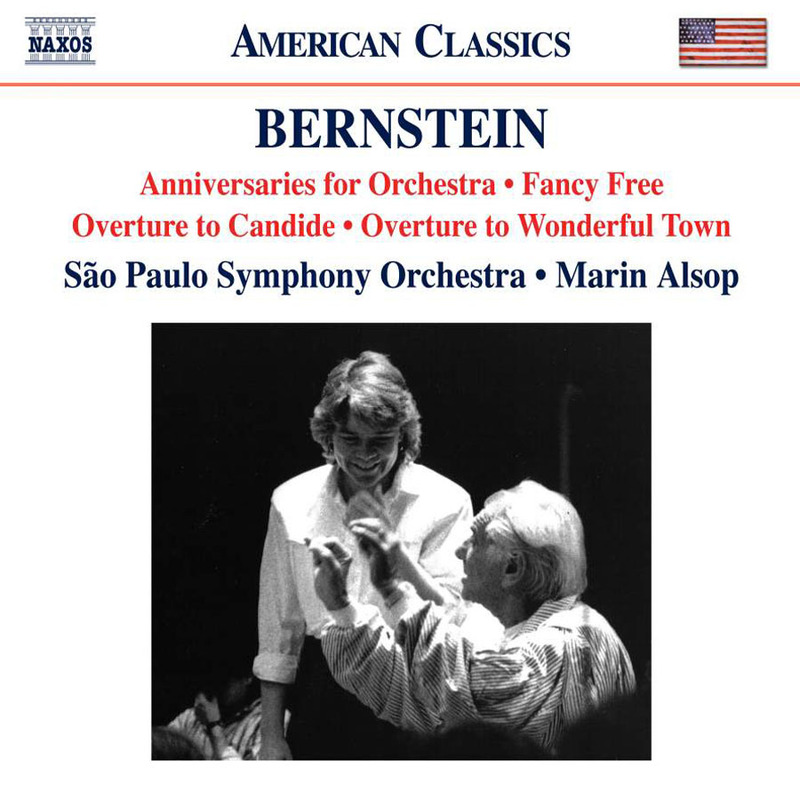 The best known pieces on this disc are the Candide Overture and the Fancy Free Suite and they are each splendidly performed by the members of the São Paulo Symphony Orchestra under their music director, Marin Alsop. The ever-popular Candide Overture is given an unhurried, bright and alert performance. In the Fancy Free Suite the jazz influence is much in evidence. The work is divided into seven scenes with a central Pas de Deux and Alsop et al successfully conjure up the downtown atmosphere of urban New York most effectively in this top notch account. A much rarer item is the performance of the piano piece Anniversaries in a transcription for orchestra by Garth Edwin Sunderland. Often I find myself preferring the original piano version when listening to transcriptions such as this, but in this instance Marin Alsop and her players make a most convincing case for the work and I would strongly urge readers to give it a listen. The disc ends with the Overture to Wonderful Town – a straight forward medley of tunes taken from the show – in which the performers seem to be having a wonderful time and this brings the disc to a great close. At bargain price, with excellent sound, this is not to be missed and as such this is our bargain choice for November.